Thirty years ago, at 4:20 PM on July 14, 1971, Bishop Robert Whelan, SJ offered a blessing in Studio A. At 4:29 PM, staff pressed the “On/Raise” button on the remote control. Three miles away, the 10,000 Watt signal immediately came to life. At 5:00:00, Bishop Whelan pressed the “Play” button on the studio’s reel-to-reel tape recorder, beginning KNOM’s first program. It sounded very smooth on the air, but as you will read, behind the scenes there were moments of extreme panic. Thank you for your support for this vitally important radio mission. As we enter our 31st year of service to western Alaska, we thank God for your friendship and prayers. 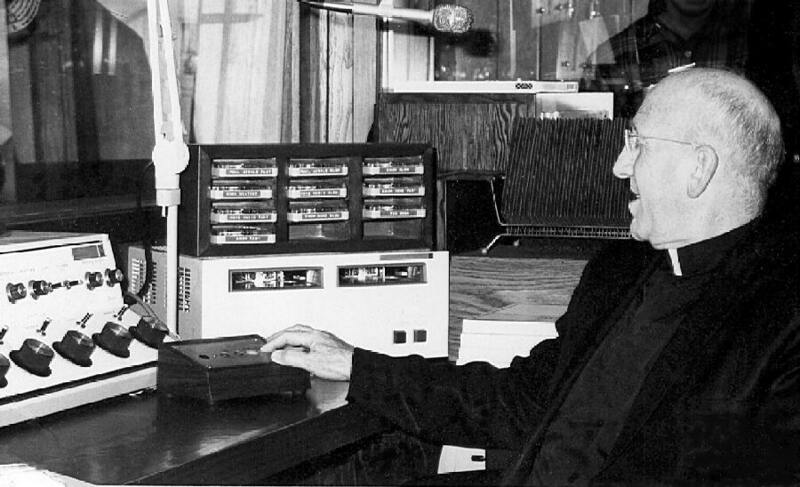 AT PLAY (left): Bishop Robert Whelan’s finger rests on the tape recorder’s “Play” button, preparing to launch KNOM’s first program. Beaming God’s Love throughout arctic Alaska for thirty years -- thanks to you. INSPIRATIONAL SPOT: God of Love, Father of all, the darkness that covered the earth has given way to the bright dawn of Your Word made flesh. Make us a people of this light. Make us faithful to Your Word that we may bring Your Light to the darkness of a waiting world. top PANIC!!! As you’ve read over the past months, the early KNOM antenna system was extremely unstable. For the station’s first years, it suffered sudden incidents of an unknown origin that burned insulators and caused all kinds of grief. July 13, 1971, the evening before sign-on, Tom Busch turned on the transmitter for a test. Five minutes later, the transmitter shut itself off and refused to go back on the air. 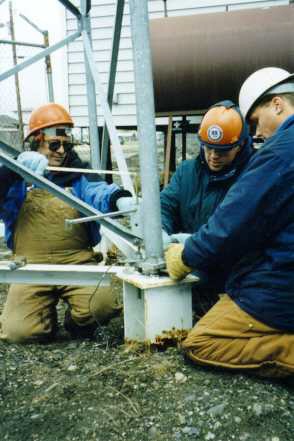 Inside the antenna tuning unit, which electrically matches the transmitter to the antenna, a heavy-duty copper strap which carried the signal had burned through. 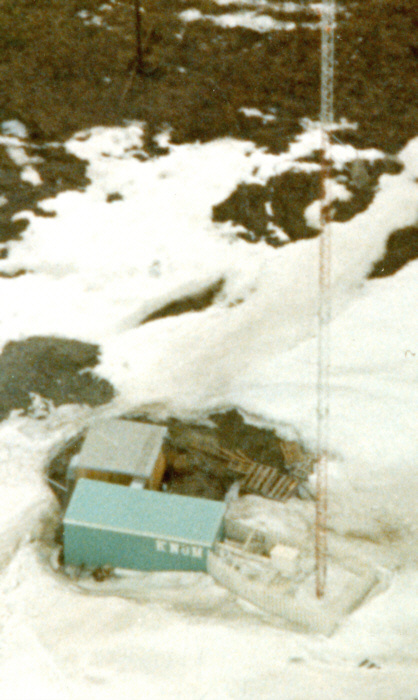 (Left): The antenna tuning unit is the white box near the base of the tower, in this 1973 aerial photograph. The loss of the strap damaged the transmitter. “It was okay,” Tom says, “except for six resistors.” They were of a very unusual value (one Ohm, ten Watt). Tom scrounged through every box of spare electronic parts in town and could not find even approximate replacements. If ordered from Anchorage, the parts would never arrive in time for the next day’s premier broadcast. A gloom fell across the volunteers. Then, someone remembered that volunteer support nurse Kitty Orris, RN had just flown to Anchorage on a medical evacuation and was due to return on the 14th. In 1971, Nome had only four, very noisy and low grade long-distance circuits, but the staff were able to contact Kitty, who bought the dollar’s worth of parts and hand-carried them to Nome, arriving about three hours before the station’s scheduled first broadcast. At 4:29 PM, when the transmitter came on and stayed on, there were sighs of relief and cries of joy. 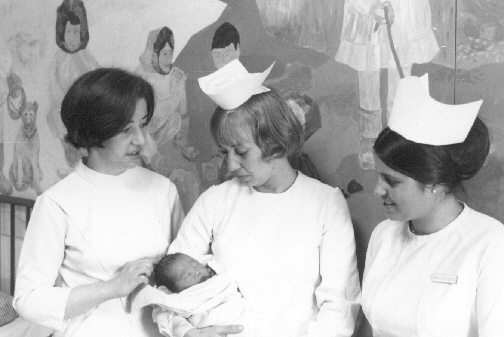 THEY MADE IT POSSIBLE (left): KNOM 1971 volunteer support nurses, from left, Sally Duggan, RN, Kitty Orris, RN and Ida Schilter, RN. For KNOM’s first fifteen years, 85% of the mission’s income was the donated salaries of men and women like these. They worked at the Nome hospital, lived as volunteers and contributed their entire paychecks to the station. Over the years, a total of 71 generous nurses and four doctors performed this astonishing feat of giving. 1.6%: That’s how much Nome’s population will increase, thanks to the 58 guests we expect for Ross Tozzi’s ordination and KNOM’s 30th anniversary July 14th! Among them will be retired Anchorage Archbishop Francis T. Hurley, who will celebrate both KNOM’s anniversary Mass and Ross’s ordination Mass. INSPIRATIONAL SPOT: Life is about choices. We can choose to focus on the best, or the worst, in others. We can choose to acknowledge or praise an individual’s gifts, talents, contributions and good works, or we can choose to be blind to one’s good characteristics and see only their faults. Tell someone today about what you admire most about him or her. Choose to see the best in others. INSPIRATIONAL SPOT: Forgiveness saves the heart from working unnecessarily. Forgiveness saves the expense of anger, the cost of hatred and the waste of spirit. top SEEING SPOTS: In 1971, many people in western Alaska had never been taught to wash their hands after using the bathroom or before eating. 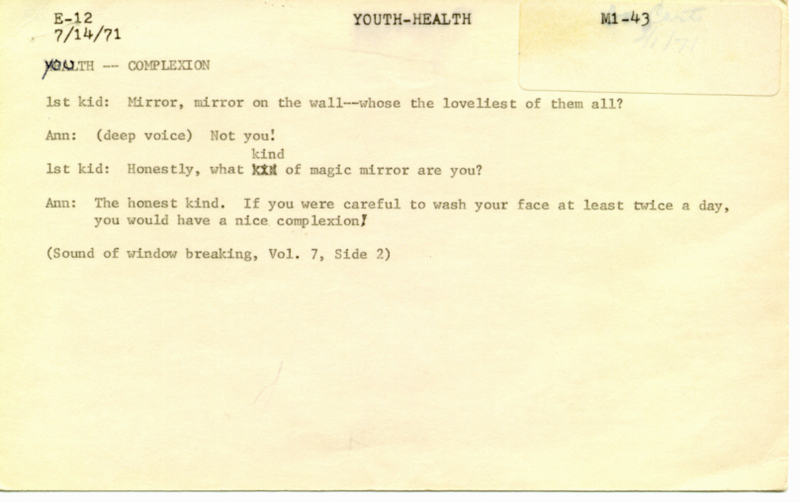 Many children did not brush their teeth. Today, the educational spots of KNOM’s early years seem laughably simple, but their basic information was new, and it’s because of KNOM’s long and steady influence that we can smile at them now. Originally, spots were organized using cards on the manager's office wall. (Left): This is the only known surviving card representing a spot that was broadcast on KNOM’s first day on the air. It resides in KNOM’s fireproof safe. IT’S A “GUY” THING: Our tower expert Rod Ewing (left, with dark glasses, in 1977) hasn’t been able to assemble a large enough crew of experienced climbers and riggers to tackle the rebuilding of our antenna. We’d hoped to complete the work in June, but this is the busy time of year when workers are engaged in other, more profitable jobs. We haven’t given up. All of the new antenna wires and insulators are sitting inside the transmitter building, all set for when a crew is available. OUR SURVEY SAID: We hope that you are as happy and as humbled as we are to see the results of an audience measurement survey conducted by Eastlan Resources, in Nome and several villages during the month of May. In Nome, there are three radio stations besides KNOM, as well as many signals available from the local cable television company. With all of that competition, 77.1% of Nome adults listen to KNOM. Of the five distant villages surveyed, one can receive one other station and four can receive two others. KNOM’s share of the audience was 79.3%, 81.4%, 85.7%, 91.6%, and in one village, 100%. Combining Nome and the villages, KNOM’s overall audience share was 80.1%. According to Eastlan, 54% of KNOM listeners never move their dials, and on the average, tune in for 2-1/2 hours a day. The survey, which includes very detailed ratings according to time of day, listener age and gender, will help the KNOM staff analyze our programming in order to serve our audience even better. INSPIRATIONAL SPOT: There is no saint without a past, no sinner without a future. ON THE SPOT: Since KNOM’s first day on the air, we have broadcast approximately 800,000 inspirational spots and 800,000 educational ones. The spots are a major focus of KNOM’s mission, woven among music and news. The average KNOM listener hears 7,590 spots every year! Thank you for making this, and all of our work possible. Thank you for being one of those wonderful people who support our work with your financial contributions and your prayers on our behalf. Our mission is now the oldest Catholic radio station in the United States, thanks to you. May Our Lord allow our radio mission many more years of service to village families throughout western Alaska, and may He greatly bless you for your kindness. God bless you! INSPIRATIONAL SPOT: The average pencil is seven inches long, with just a half-inch eraser. Who says optimism is dead?